Adventures in light — The Lotus Studios inc. Many times I get ask, “What’s the most we can add to our cake smash?” Or “How many props do we get included?”. Have you ever heard of the phrase Quality over Quantity? This philosophy is true even in photography. Along with “Less is more” In a photograph composition is just as important as what your shooting. Even as important as your exposure settings. You could have the perfect settings and perfect subjects but if your composition is out, everything is going to look off. and out of place. Kind of like those photos you used to take with the disposable Kodak film cameras. Out of the 36 exposures (of the ground) only one made it out and was half decent. ha! I want to just take a moment and thank all of the organizers, parents and players for making this year’s Hockey Alberta Provincials one of the best yet! Thanks to all of you we were able to field three systems this year covering more of your games than we ever have in the past. Our goal to bringing the the province of Alberta the highest quality, on-site print Photography is coming into being on a scale never imagined! People! I am so excited to share Jennifer and David’s wedding with you today, which could have seriously been featured (and very well may be in the future) in ANY bridal magazine across the world. These two have impeccable taste, to the point where I cannot even describe how perfect every single detail was. It’s a good thing I’m a photographer, then, yeah? From the insanely gorgeous floral arrangements to the decadent hotel for getting ready, there wasn’t a thing that wasn’t thought of and carefully planned. And when I saw Jennifer in her wedding dress, I almost lost my breath! (Can’t even imagine how Dave must have felt seeing her walk down the aisle)! What a joy it was to photograph you on this special day, you two. I hope your years are full of happiness, light and just as much beauty! In my 17 years as a photographer, I’ve been extremely lucky to get to work with all kinds of amazing human beings. As you’d expect, every couple is different from the next. Some are all about the PDA, some are all about keeping it sweet and romantic, and some people… well, some people are just downright hysterical! Meet Tara and Don, two of the goofiest people I’ve worked with in a really long time. The session took place at St. Albert Place in St. Albert, which was a great backdrop for our two of hours together. The entire time these two were playing pranks on each other,running around and just being plain goofy, and I was there to catch it all on camera. I thought it was particularly funny when Tara tried putting her tongue in Don's ear. Ha! These two are officially tying the knot sometime this coming summer, so wish them lots of luck! But really, with a relationship as lighthearted and fun as this one, I don’t think they’ll need any luck at all! Looking at the chart above you are probably thinking, "oh god,I'm going to have to do math! It's going to be like the square root of the curvature of of the moon on an autumn solstice will tell me what I need to know!" Thankfully because of the many years of photographers before us we don't have to. And we don't have to stare at gross chats like the one above either. But understanding the technical aspects of photography can be quite daunting to the average person. Numbers and terms that seem so alien - how could anyonemake sense of this jargon! But if we look at what is actually happening inside the camera with the changes we make with all those weird numbers and such, we can see that it isn't all that scary after all. So what are the three pillars of photography? 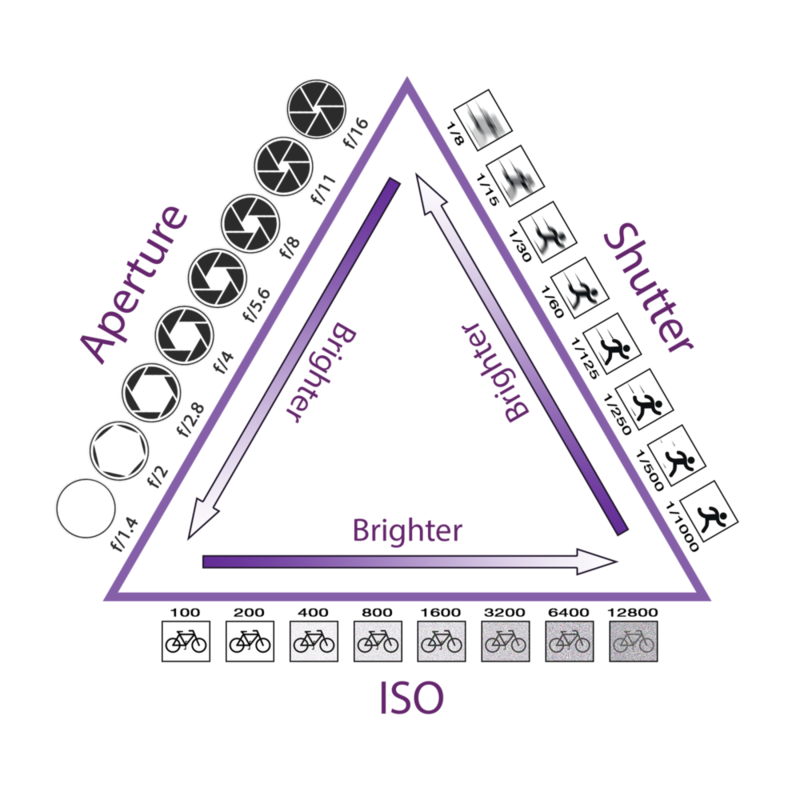 These are the three control points we will call them, that we use to control the exposure - exposure is the amount of light paying through the lens and hitting our film or sensor. And they are, ISO, Aperture(F-stop), and finally shutter speed. Let's start with ISO. what is ISO? Well, ISO stands for International Standards Organisation and it refers to the industry norm for sensitivity of emulsion based film, with 100 ISO being not so sensitive (and the standard ISO used by most people) to 1600 ISO which is extremely sensitive to light. That's basically it. We can see in the image below, that the lower the ISO the clearer the image and the higher ISO the grainier it gets. Now if you also notice, that directly correlates to the Aperture or F-stop. Now let's take just a half step back here. "What the heck is F-stop?". "The f-number of an optical system such as a camera lens is the ratio of the system's focal length to the diameter of the entrance pupil. It is a dimensionless number that is a quantitative measure of lens speed. It is also known as the focal ratio, f-ratio, or. f-stop." Thank you wikipedia! I know that's a bit of a wordy explanation but it essentially says, F-stop is how big the hole in your lens is. The smaller the number, the bigger the hole. And vice versa. So what does the hole size mean for us? A bigger hole let's more light in, which is good in darker areas. But it also does something really interesting with our depth of field. If we focus on someone that's close to us, and take the shot you will see that the background behind the subject is blurry or soft. This is called bokeh. Now before we get too carried away, what we need to remember is that our aperture will either let more light in, our less. If we look at the triangle below you should begin to see that as you change one side of the triangle the other two see effected as well. Finally that leads us to the shutter speed on the right side of the triangle. Simply put the shutter speed will decide how much motion we see. Do we want jimmy be a streak of blue as he is running past second base and onto third? Or do we want him crisp and clear seemingly floating in mid air as we catch him between strides? Now what has to happen to the ISO and the F-stop if we increase our shutter speed up to 1\500th of a second? See if you can figure that out by reading the triangle below. Did you figure it out? Your answer should be, the ISO must be increased and the f-stop should go down(open). It is all a balancing act with the triangle. It still will take some practice to remember but once you do, you will have the most control over light that you will ever get. From there we tweak it this way and that to get different effects. I hope this makes a little more sense now and not so alien and confusing. Action Sports Photography and gifts ltd.